PrivateInternetAccess is one of the most famous VPN providers in the industry. Speeds can be hit and miss. PrivateInternetAccess otherwise known as PIA is one of the most well-known VPN services in the world. With subscriber numbers in the millions they may even be the biggest VPN provider in the world. Being the biggest doesn’t always equal being the best and as we haven’t tested their service since 2015 we thought it was about time we put them through their paces in 2017 to find out if they’re still as good as they were previously. So find out what we thought in this PrivateInternetAccess Review 2017. PrivateInternetAccess is like most VPN companies these days. They have one package available that differs in price depending on how long you subscribe to the service. Pay on a month by month basis and you’ll pay their most expensive subscription fee but commit to a year and the price will be drastically cut by over 50%. The pricing is certainly geared up to push you towards taking a yearly package and with the saving on offer it makes sense to take the plunge and opt for a year service. That said, even if you choose to pay on a monthly basis the service is still a lot cheaper than most of the competition and even close to the monthly price of a yearly package from other providers. The good news is you can’t really lose price wise no matter which subscription length you opt for. PrivateInternetAccess have a huge range of ways to pay for the service including the standard Credit / Debit Card and Paypal types plus additional services such as Bitcoin and more. You can even pay using many types of gift card and by doing so you don’t have to supply your address or any other detail other than your email address. PrivateInternetAccess offers access to the standard VPN protocols that nearly every other major services offers including PPTP, L2TP and OpenVPN. 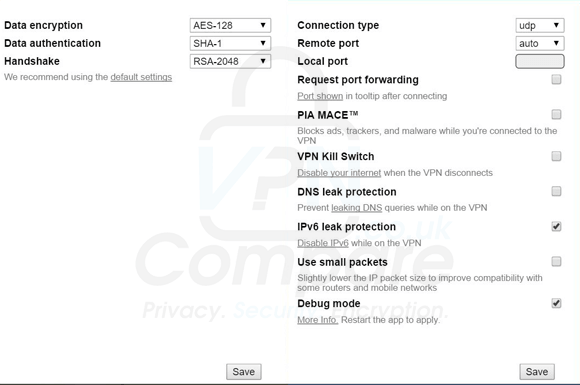 PIA also offers access to a SOCKS5 proxy alongside the VPN protocols. The full range of major devices are supported on the PrivateInternetAccess service with software for Windows PC and Mac plus apps for both Android and iOS. For the purpose of this review I made use of both the Windows software and the Android app and have been using them over the past few weeks to see how well they work. Although I didn’t test either the Mac OS software or iOS app they work in a similar manner so you can get a good idea of how the service works with those systems too. The Windows software hasn’t changed all that much in the 3 or 4 years I’ve been reviewing the service. Under the hood the software does the job it is intended to do and does it well but if you’re looking for a client that looks good then you may be a little unimpressed with the dated interface of the PIA software. Strangely much of your interaction is going to be via right mouse clicking the notification area icon as there is no direct way to connect on the main interface screen. Although this is generally a faster way of doing things it may feel a little cumbersome if you’re new to VPN software or VPN services in general. When not connected you can access as simple or advanced interface. 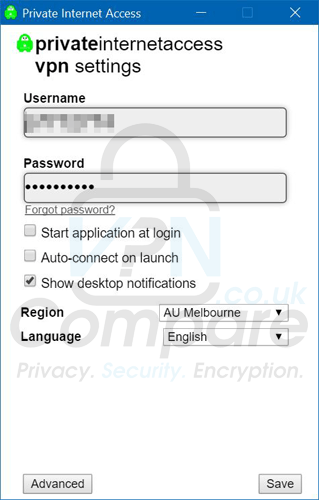 The simple interface basically allows you to select a region and language as well as being able to select if you want to application to start on boot, auto connect or show desktop notifications. The advanced area is actually rather good and lets you select connection type, remote port and local port. You can also request port forwarding, use “PIA MACE” which stops adverts, malware and trackers, enable a VPN killswitch, enable DNS leak protection, enable IPv6 leak protection, use small packets and put the client into debug mode. There is an added section for encryption that allows you to select between a range of modes for encryption, authentication and handshaking. I like the way PIA have split the software into both Simple and Advanced modes as it makes it easy for new users while allowing those who know what they’re doing to change the important options. Overall it’s not visually the best software but the functionality is certainly top quality and it has plenty of built-in features. The Android app has been completely redesigned since I last tested their service and it’s been vastly improved. The main screen features a simple swipe button to make connection or to disconnect. If you’re a new user then you can press this and you’re protected. Nothing more needed. If you want to change country or region then simply clicking the button below allows you to do this. A new window will open that will allow you to select a server based on location. It’s actually really easy to understand so if you’re a beginner then you won’t have any trouble navigating around. The Android app is quite similar to the desktop app and in the Settings area you’ll find options including the ability to enable PIA MACE to block ads, trackers and malware, Block local network, Change between TCP and UDP modes, Select a Remote and Local port, Port Forwarding, Internet Kill Switch and the option to Use small packets. The encryption options can also be changed exactly like the desktop software. I really liked the fact you have access to almost identical options as the desktop software, especially the ability to customise the encryption options. Overall the Android app looks good, is easy to use and is packed full of features. Between my 2013 and 2015 review of PIA they doubled the server locations from a measly 10 to a more respectful 20. While they haven’t quite expanded at the same rate in the past two years since I last reviewed their service they have added another 5 countries bringing the total to 25. USA, UK, Canada, Australia, New Zealand, Netherlands, Sweden, Norway, Denmark, Finland, Switzerland, France, Germany, Ireland, Italy, Romania, Turkey, Korea, Hong Kong, Singapore, Japan, Israel, Mexico, Brazil and India. PIA aren’t quite as big as other providers with some offering between 60 – 80 countries but for the price it seems like a more than fair selection and most critical locations are covered. PrivateInternetAccess offers a 7-day money back guarantee so if you’re a little wary about signing up you can do so risk-free. If you’re not happy with the service or it just isn’t suitable for your needs then you can simply get a refund. A total of 5 simultaneous connections can be made with one account. For the price this is certainly good value for money because it means you can connect your desktop, laptop, tablet, phone and even games console or TV all from with one package. If you don’t have so many devices then you could also potentially protect all of your families devices in the home. If you’re extra privacy conscious then you may want to consider if PrivateInternetAccess is suitable for your needs. PIA is a US based corporation and while the US has no mandatory logging requirements some users who have high sensitivity such as journalists or other such users may wish to shy away from a service based out of the US. If you’re extra privacy conscious then you may want to consider if PrivateInternetAccess is suitable for your needs. For the everyday man or woman it shouldn’t be an issue. Torrent and P2P use is allowed across the whole network and there are no traffic logs kept so what you download and do while connected to the PIA service remains private. Before I start it’s safe to say that PrivateInternetAccess isn’t the fastest provider on the block but nor are they the slowest. There are many reports of users getting slow download speeds but there are an equal number or more that get totally fine speeds. In my own tests it all seems to depend on the server you connect to. While one might be congested with other users resulting in slow speeds there are other servers where speeds are fast. My local wi-fi connection gave a speed of 38.45 Mbps and the following results were recorded when connected to the VPN service. The results from Sydney, Melbourne and Singapore were actually rather good with minimal speed loss but the result from New Zealand was pretty dire. It’s likely the New Zealand result was a freak occurrence at the time of testing but it goes to show that the speeds achievable can sometimes be a hit and miss affair. I tested the London, UK server from Sydney in Australia with a few services such as BBC iPlayer and ITV Player and had no trouble streaming content. So speeds are definitely good enough to watch video abroad. PrivateInternetAccess has a massive range of encryption options for Data Encryption, Data Authentication and Handshaking Encryption. In fact, encryption is one area where they excel which wouldn’t be my first impression when you look at the price of the service. Data Encryption options available are 128-bit CBC and 256-bit CBC. Data Authentication options available include SHA1 and SHA256. Handshaking encryption options available include RSA-2048, RSA-3072, RSA-4096, ECC-256k1, ECC-256r1 and ECC-521. PIA make it clear that while they comply with all legal requests they do their utmost to ensure that they are legal and limit the amount of information (if any) that they supply when complying. It is clear PIA takes your privacy seriously and as a responsible VPN business the policy details seem in order. Support is an area where PIA are lacking a little. While they have an extensive support guide section and a support ticket system, that is where the support options end. While there is nothing inherently wrong with only having a support ticket method of contact and in fact many providers do, I would expect from such a large provider they would have a live help option. I suppose for the cheap price it’s a little too much to ask for a live help option but it would be a nice addition to the service. PrivateInternetAccess is one of the cheapest VPN services in the industry and also one of the biggest. The price is clearly a big draw and helped PrivateInternetAccess amass a huge customer base. It isn’t without reason that many of those users keep the service and shows that PIA is doing a lot right. The software and apps are all functional and make the service easy to use allowing you to get connected quickly, secure your privacy and access geo-blocked content. With VPN servers in just 25 countries, PIA is on the smaller side in terms of coverage so you should consider if their server offering is suitable for your needs. For most locations in North America, Europe, Asia and Australia the selection will be ideal. Speeds on the service are variable from excellent to average and there are countless reports all over the internet proving that is the case for many users. For the price, PrivateInternetAccess offers a very attractive VPN service. There is little wrong with the service and if price is one of your main considerations then it’s definitely worth signing up. My advice would be to sign up to the service, test it with their 7-day money back guarantee to see if the servers you need are fast enough and then either keep it if it is suitable or cancel if not. Overall an excellent VPN service let down by a few kinks that could easily be rectified.